Greetings from Gulfport, MS, home of yesterday’s ice storm Leon. Those of you (like my son Domer) who have endured months of snow and cold might not think much of our “little wintry mix,” but let me assure you, it’s way worse than it looks. When I took Darling Doggie outside yesterday, I could tell a storm was on its way (The Weather Channel only confirmed it). How did I know? 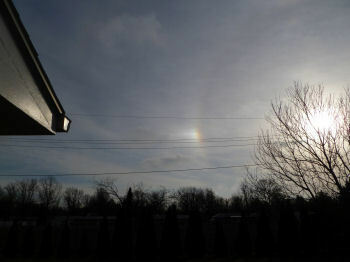 Sun dogs often predict rain or snow. So it didn’t surprise me when the snow started falling mid-afternoon. Falling fast, like feathers swirling in a pillow fight. And after we’d had between three and four inches of the white stuff, we got some freezing rain. 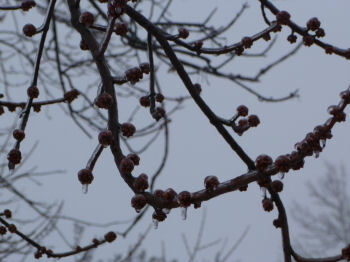 Ice covers the buds on this silver maple tree. 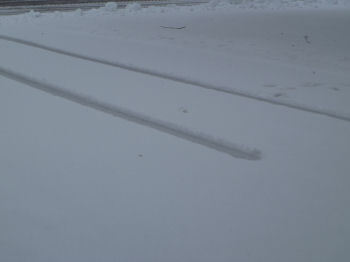 Tire ruts show how deep the snow is. Now, I much prefer having snow at the end of the year, rather than the beginning. 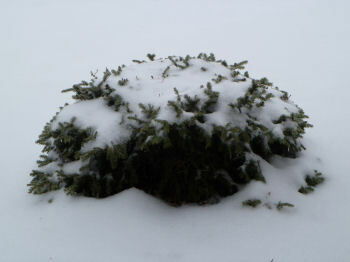 Something about a White Christmas is very appealing, and what’s a New Year’s Eve without a definite chill in the air? But nobody asked me. And now we’ve got this snow on the ground. Just when everybody is starting to think Spring. 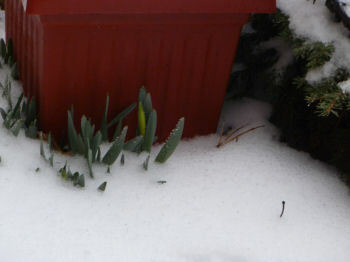 These are going to be yellow daffodils. I woke up in Narnia this morning. Yes, it’s beautiful. Yes, it’s historic. But doggone it, it’s dangerous and I’m tired of it! 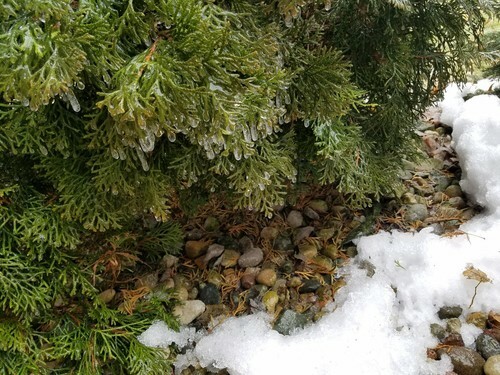 It started yesterday with freezing rain, sleet, and ice. The stuff fell for hours, off and on. We’re in line for more ice today, as if we haven’t had enough. Then, we’re supposed to get six inches of snow. Then, the snow is supposed to get blown around in gusty winds. Can you see the recipe for disaster here?? 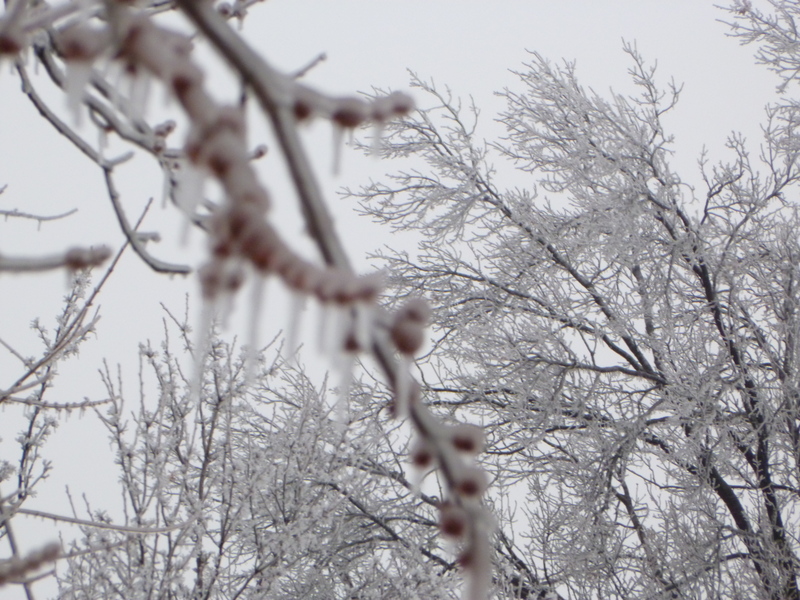 Iced power lines (no, my city didn’t bother to bury them like normal places do), iced tree limbs, and high winds. My dog gives me the look that says, “What, are you kidding?” when I send him out to potty. Slipping and sliding on the skating rink that’s my backyard, he finally does “the deed,” then tucks his head and tries to scamper back inside. Poor thing looks like a drunken sailor. No merry barking and racing around chasing birds and squirrels for him today! Fortunately, we at least were forewarned. The prognosticators have been talking about this beast for a week now, giving us plenty of time to gather necessities: food, water, medicine, books, etc. But how does one prepare for losing power when the temps drop to below zero?? When did I become such a weenie about winter weather? As a kid, I loved the snow. It was beautiful coming down, and it marked the beginning of the Christmas season. I got to wear sweaters and mittens; Dad made a fire in the fireplace, and Mom gave us kids hot chocolate with marshmallows for our after-school treat. 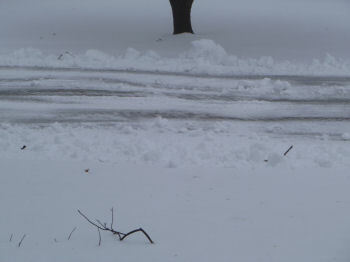 Some days the snow would drop by the bucket-load, starting at night and blowing into huge drifts next to the house. The administration would cancel school, and everybody would “hunker down” inside for several days. No problem — I’d curl up with a good book and magically be transported to another time and place. All those weather casters need to do is hint at snow, and I go into a tailspin! I stock up on supplies — does anybody really need fourteen cans of pork ‘n beans? I gas up the car and make sure I’ve got a thick blanket in the trunk. I dig out the snow shovels and the long underwear; I check to see whether there are flashlights (with batteries) and candles (with matches) just in case we lose electricity. And I watch the Weather Channel on TV or Accuweather on my computer, examining radar screens, long-range forecasts, and so forth until I, too, am a master of the lingo. Honestly, I don’t mind the snow so much — it’s the ice. Particularly when I’m driving. I know enough to leave way before I need to be some place, then creep “old lady style” until I arrive safely. Nobody else seems to have learned that lesson. They zip along, merrily chatting on their cells or balancing a cup of hot coffee or punching buttons on their radio, without even giving a thought to how trecherous the roadways are. So I’ve just got one teeny request. Slow down, okay? We both want to get where we’re going in one piece, and you riding on my bumper won’t make me go any faster, I promise!